While at a club with her best friend Simon, 15-year-old Clary Fray witnesses what at first looks like a murder -- until the body disappears. Not 'disappears' as in is 'hidden', 'moved' or 'stolen'. 'Disappears' as in 'vanishes'. Right in front of her. And when the bouncer shows up to deal with the disturbance, Clary realizes that she's the only one who can see the three perpetrators. "There hasn't been a mundane who knew about us for at least a hundred years." "About us?" she echoed. "You mean people like you. People who believe in demons." "People who kill them," said Jace. "We're called Shadowhunters. At least, that's what we call ourselves. The Downworlders have less complimentary names for us." "The Night Children. Warlocks. The fey. The magical folk of this dimension." Clary shook her head. "Don't stop there. I suppose there are also, what, vampires and werewolves and zombies?" "Of course there are," Jace informed her. "Although you mostly find zombies farther south, where the voudan priests are." "Don't be ridiculous. No one believes in mummies." Loads of fun, wholeheartedly recommended to fans of urban fantasy. 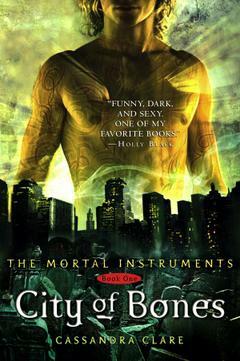 It's funny and smart, faast-paced with loads of action, romance -- some steamy moments and a love triangle, Three Powerful Magical Items, a magic carriage ride through the city*, a very cool system of non-magic, a mysterious villain named Valentine and yes, vampires AND werewolves. Your understanding of their world will expand as the characters learn -- the politics and history of the Shadowhunters are much more complicated than our young heroes and heroines realize. My only complaint is that Clary can be somewhat dim -- there's a rather large, somewhat obvious plot point that she doesn't figure out (actually, NOBODY figures it out) for a zillion years (well, a few hundred pages) and she's also one of those My Best Friend Is In Love With Me But I Have No Idea girls (though, when it came down to it, she did redeem herself somewhat in my mind). Then again, there was a different twist I didn't see coming AT ALL. I actually have some questions about that one, but I'll need to re-read the relevant passages first. So there you have it. Regardless of my minor issues, I'm still depressed that I'll have to wait until March for the next book! *Fans of Holly Black should pay special attention to this scene.